Cuddlebuddy wanted a tut on removing wires so here it is. I used his photo "Cute Little House". 1. Right click on the Lasso tool and select the "Polygonal lasso tool". 2. 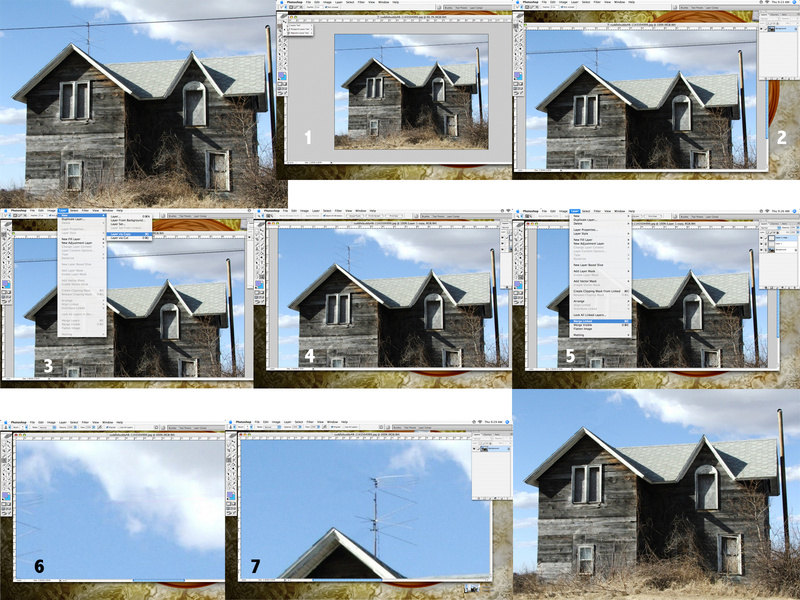 Select an area of sky just above or below the wire. Try to make it reasonably thin and the photoshopping won't be as obvious. 3. Under the "Layer" menu, select "New-> Layer via copy". 4. Move the new layer down (or up if you selected an area below the wire) and move it over the top of the wire to hide it. My selection wasn't quite big enough to cover all the wire so I just duplicated it again (via "Layer -> Duplicate layer) and used the duplicate to help hide the wire. 5. Link all the layers and merge them. 6. Now select the clone stamp tool and use it to clean up any messy/obvious bits. It's easier if you zoom in a bit. 7. Finally I used the clone stamp to remove the TV antenna. It's pretty easy when you have an even background like the blue sky in this photo. good tutorial Samatar. About time some one did one on wires. Nicely done Sam ! A tutorial like this was really needed ! Boy, did I need that.You don''t know how much. I am so frustrated trying to learn photoshop, I could scream. I have quite a few old pics that I need to change the sky's color or put clouds in a photo. Can anybody out there help me with that? I have P.S. Elements 4. "It's far more impressive for others to notice your good qualities without your help." Wow! Thank you Sam, this tutorial is clear and concise...great job! Thanks for the guidance, I've tried to do this but have never been really successful. I needed to know this as well as I have some images that have fences in fron of them. An excellent tutorial Sam.... this will be of great help. I have been trying to remove some wires & a sign from an image. Super work. Thanks, I have needed that many times. I'm always looking for a new way around PS.Thanks Sam. i like it, but i wont use this until i start taking photos. If you read this you're obviously bored. Did i read your mind? I know im good. Thanks Sam I'll try it. Great tutorial.